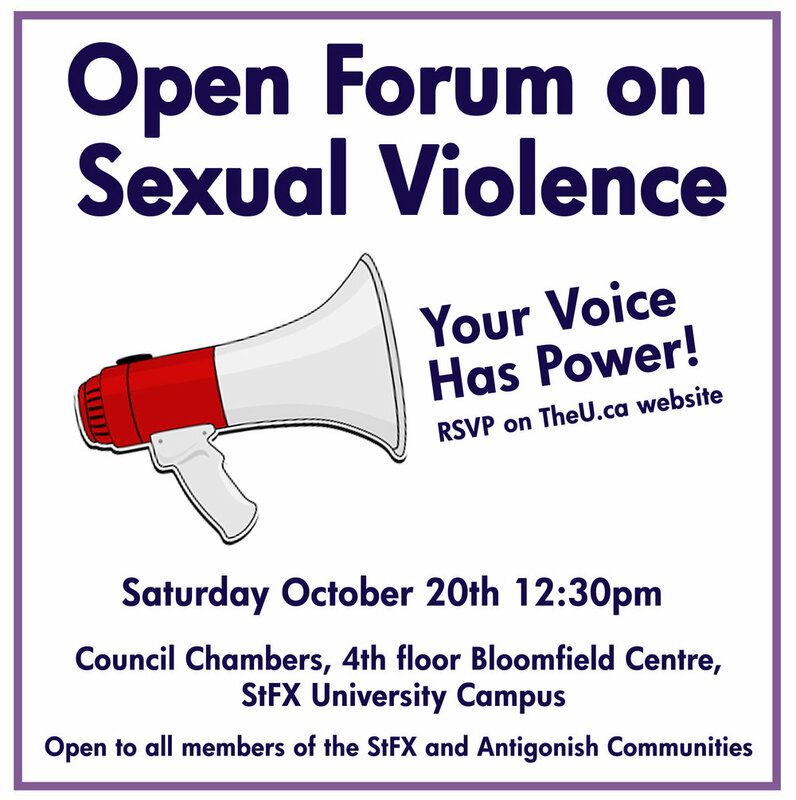 On October 20th from 12:30 PM-3: 30 PM, the StFX Students’ Union invites you to attend an open-forum regarding Sexualized Violence which is open to all members of the StFX and Antigonish communities. The StFX Students’ Union has recognized the need and want for members of all communities to be able to speak about these issues and make positive changes regarding sexualized violence on StFX campus and in the broader area. On October 10th 2018, we released our next steps on addressing sexualized violence at StFX https://www.theu.ca/announcements/2018/10/10/students-union-response-to-sexualized-violence and on October 20th, we want to broaden this conversation to be able to advocate for what you want to see change as well. The forum consists of two sessions, one addressing sexual violence at large and the second addressing StFX University’s Sexual Violence Policy. Session 1 is a carousel-style where you will have the opportunity to spend time at a table discussing one of these four topics and then move to the next. - What do you believe is good about the policy? - What do you believe should be changed within the policy? - What do you believe should be added to the policy? - What additional recommendations do you have? This event will be taking place in Council Chambers, on the 4th floor of the Bloomfield Centre (October 20th, 12:30 PM-3:30 PM) and we ask that you RSVP with your name and current email address in the case that a change in venue is required. The StFX Students' Union, known as The U, is a registered society in the province of Nova Scotia that represents the students of St. Francis Xavier University in Antigonish, Nova Scotia, Canada.